$1=4 Meals for our neighbors in need. View this message on our website. Update your email subscription preferences. Your Impact Reports are Ready! 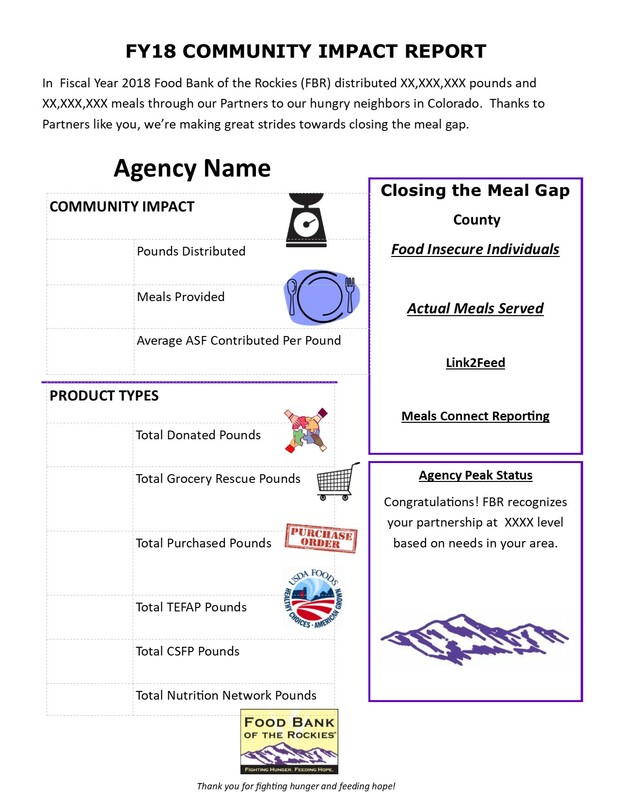 Food Bank of the Rockies’ Community Impact Reports (CIR) will be released September 2018! Just as last year, your hunger relief organization will receive an FBR partnership report reflecting county food insecurity and meal/poundage statistics. average Agency Support Fee contributed. To recognize the different levels of partnerships, we assigned a peak status! Your peak status is based on pounds/meals distributed to clients through partnership and distribution of FBR product/programs. If your organization distributes additional meals through non FBR sources, these meals are not included in your report totals. FBR values all partner agencies regardless of assigned peak status. If your organization would like to increase meal distribution to clients this upcoming year, please contact us to discuss program options! Use this document to submit grants, set meal goals, display for your clients, and share with your community and supporters. Make sure your contact information is correct so your CIR will get to the right person at your organization! Submit all contact information (along with mailing address) updates to your program representative today to ensure delivery. Do you run an afterschool program for children? Apply for CACFP under FBR’s sponsorship! 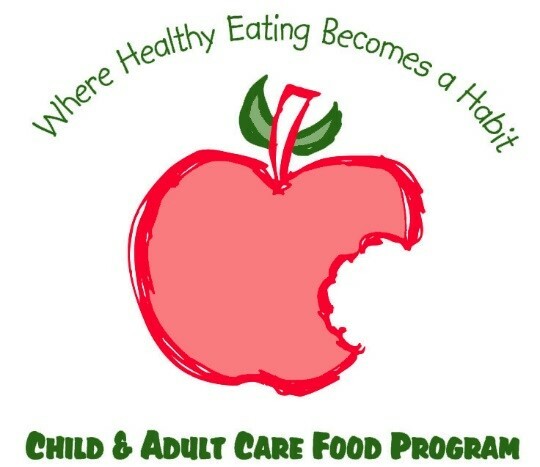 Food Bank of the Rockies offers an assortment of nutritious food for qualified neighborhoods through the Child and Adult Care Food Program (CACFP). Returning sites received an application via email in July. 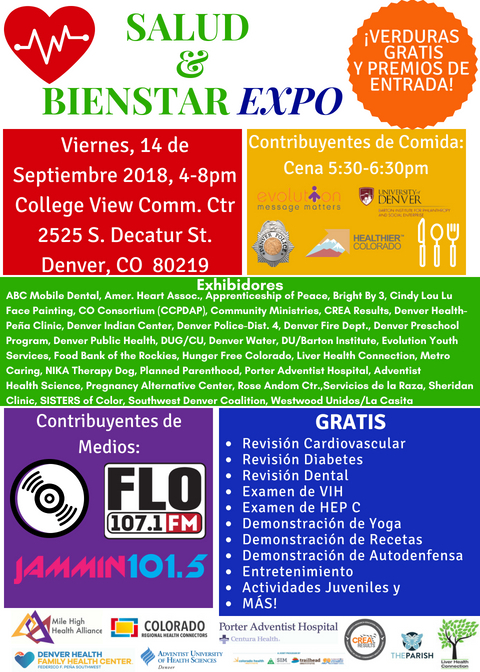 If interested or have questions, please contact Brandy Webb at 303-375-5862 or apply online 2018-2019 CACFP Application. Powdered Instant Non Fat Milk for CSFP – Are You Distributing per the Guidelines? The Powdered Instant Non Fat Milk is a required component for bi-monthly distribution with the food box and cheese unit. The months for distribution are October, December, February, April, June and August. Milk received during the prior month should be set aside and distributed during the correct month. Please remember to record the left over milk on the Inventory Tracking Form submitted monthly. TEFAP – Fresh Milk is arriving! FBR will be receiving fresh milk deliveries starting in October. This milk will have a short time period for Agency pick up and distribution to clients. We’ll be sending out an email announcing the dates and quantities available. Please keep this in mind for planning refrigerator space. The ultimate goal should be getting this fresh product into the homes of clients for their families! If quantities permit, please adjust your product distribution rates to allow several units per household. CSFP and TEFAP – Civil Rights and Food Safety certification is past due! If you have not completed your certifications, please do so right away. If you are unsure and/or experiencing difficulties in completing, please contact us for assistance. Monday – Friday 9:00a.m. – 3:30p.m. Monday - Thursday 12:00p.m. – 3:30p.m. 2nd Saturday 9:00 am – 11:30 am. **Please check with FBR staff for available dock door prior to moving your vehicle for loading. Each Partner Agency is allotted 20 minutes to pull product to then be weighed regardless if they are picking up an order or not. With an Order: Pick up person must arrive 20 minutes prior to scheduled pick up time. Arriving later than 20 minutes prior may result in less or no time in the FFC.- Example: Order pick-up 9:00 am FFC arrive at 8:40 am. 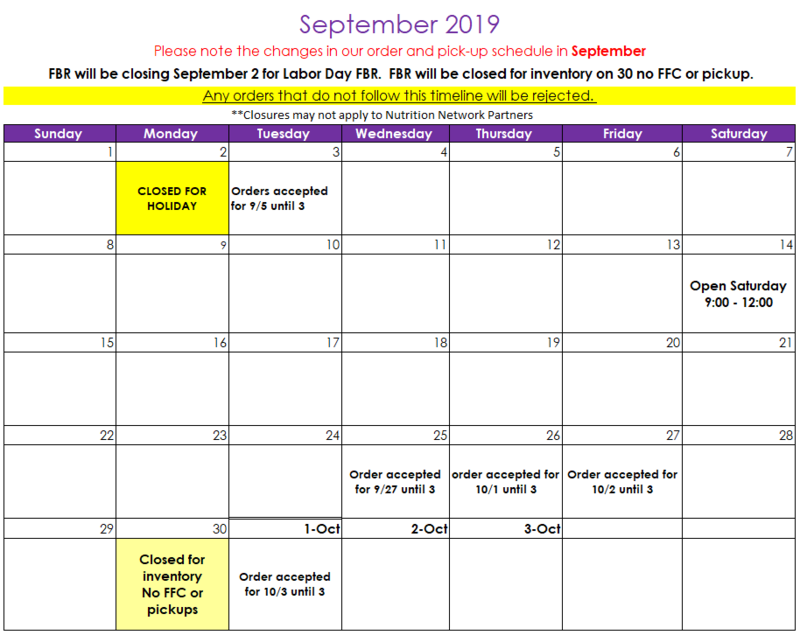 ONE Authorized Partner representative and ONE other representative may enter the warehouse to select FFC items. Maximum 2 people per Partner agency in the FFC area. **Authorized Partner is one who has been assigned as a “shopper” on the agency account along with attending an orientation session. At the end of your 20 minute time period, please take your carts to the scale for weighing.FBR Staff or volunteer will notify you of expired time, if needed. One assigned dock door per partner agency; maximum 30 minute loading time. Please bring an adequate sized vehicle and volunteers to load your order. Lift loading with a forklift is available on request. While there are no limits on most product, FBR does ask you to receive amounts you can safely transport, store and distribute to clients. We further ask partner agencies to be respectful of others by sharing products that are in limited quantities. Rummage items limit 2 per agency. Please help keep our FFC clean. Do not place or leave product on the floor. If you spill or notice a spill, notify FBR staff or volunteers immediately to minimize fall risks. Children under the age of 14 are not allowed in the warehouse. Thank you for assisting us by staying on schedule which allows all partner agencies to get in and out in a timely manner. Not following the above procedures could result in your program’s suspension from the FFC. Traveling More than 30 Minutes after Order Pickup? Keep your food and clients safe with these transportation guidelines. View the best practices document here. If your program doesn’t have refrigerated vehicles and travels more than 30 minutes to your food storage location, it is highly recommended to use thermal blankets or coolers with ice packs to transport perishable food. This includes food picked up from Food Bank of the Rockies (FBR) and food picked up from FBR’s donors. Keep food at a safe temperature when transporting to your Agency to prevent spoilage and foodborne illnesses. Temperature of the food should be checked when arriving at your destination to ensure items maintained a safe temperature. Temperature logs are available on FBR’s online Agency Portal and should be used to monitor temperature of food during transportation and storage. Any food that has warmed to a temperature above the safe limit should be discarded. You can purchase thermal thermometers from Walmart or Target ($12.00 and up). 6x6 Heavy Thermal Blankets are available to purchase from FBR for $33.75 each, item #17577. FBR staff will be verifying agencies’ are following safe transport practices when picking up product at our warehouses and during partner reviews.By following these food safety requirements, we’re all doing our part to keep clients safe from foodborne illnesses. 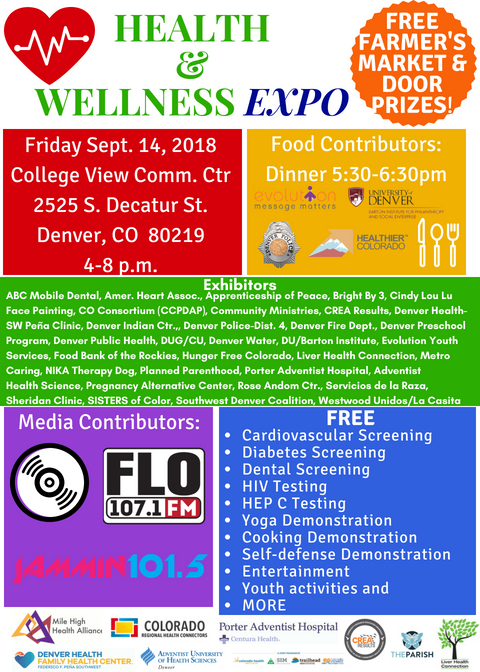 Come to the College View Community Center in Southwest Denver on Friday, September 14, from 4-8 p.m. Bring the whole family and experience free demonstrations, screenings, entertainment, and activities. There will be plenty of educational resources along with a free farmer’s market and door prizes. Hope you can attend! Food Bank of the Rockies © 2019 All rights reserved.